Fleetwood Town Academy manager Ciaran Donnelly is delighted to see another of the club’s young stars sign professional terms as Harrison Holgate was welcomed to the senior fold at Highbury. 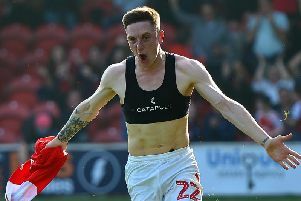 Holgate, 17, was brought on to the pitch at half-time in Town’s 2-0 win over Walsall on the final day, when youngsters paraded around the pitch as Town celebrated their youth academy. Holgate has been on a two-year scholarship with the club’s under-18s side and has impressed at right-back and in central defence. He becomes the seventh player from the club’s category three academy to sign professional terms, following Nathan Sheron, Mamadou Djabi, Lewis Baines, Dan Mooney, Gerard Garner and goalkeeper Billy Crellin. England Under-17 World Cup winner Crellin is leading the way, named on the bench against Walsall on Saturday. And after starring for Ashton United, Baines and Mooney have seen their contracts extended for another year. Djabi and Sheron, who has also been named as an unused substitute for the senior side in League One and featured in the Checkatrade Trophy, are still in negotiations to extend their stays at Highbury, having both been offered fresh deals. Leeds-born Holgate has followed in their footsteps, stepping up to the club’s development squad this season and impressing at right-back in the Lancashire Senior Cup final against Bury. And Donnelly sees potential in Holgate. He said: “We’re delighted for Harrison. He’s worked hard over the last couple of years. “He has shown a great attitude, especially when he had an extended period out due to (a quad) injury.